The photographer Vivian Maier is well known by now, at least in the storybook outlines of her career: Seen during her lifetime mostly as an eccentric live-in Chicago nanny who for some reason always carried a camera, she was revealed after her death – in 2009, at the age of eighty-three – as a photographer of grand authority. Though she is already the subject of two biographies and two movies, much about her life remains obscure, but her tale is best told by her images – more than 150,000 of them – discovered posthumously and now working their way into the public eye. Ignored in life, cherished in death, in some way permanently enigmatic – it’s a mythic bohemian trope. But this fact doesn’t undercut the value of the work. The pictures that made Maier’s name are in black and white; the twenty-three in this exhibition, taken beginning in the 1950s but mostly in the ‘70s, were in color, and the show was accompanied by a book reproducing a larger selection. This first focused look at Maier’s color work demonstrated that at a time when serious photographers left the medium to amateurs, and twenty years before William Eggleston put it on the critical-curatorial map with a show at New York’s Museum of Modern Art in 1976, Maier was handling it with savvy. The earliest image in the show, from 1956, shows a woman’s leg, she wears a stocking and a red shoe; on the left, a white plaster cast, or perhaps bandages, from knee to heel. The picture would still have traction, I think, in black and white, but rather less so. Another early photo, from 1962, of three disparate women on a Chicago street, is mostly washed out in palette – faded browns, grays, a large, blank white sky – but for the lilac hat that one of them wears, an extravaganza of floral tulle that gives the picture its purpose. Several photographs here refashioned devices familiar from Maier’s black-and-white work. While keeping herself professionally invisible as an artist, she left a great many images of herself, seizing on mirrors, shop windows, anything that might reflect her, in sometimes intricate compositions that both capture her images and suggest her elusiveness. A great many simpler works include her shadow. ¬Self-Portrait, Chicagoland, June 1975 she shot looking down at a green lawn scattered with buttercups at her feet – a lovely way to memorialize oneself, studding one’s images with flowers. These photographs of reflections and shadows inevitably make me think of self-portraits by others, notably Lee Friedlander, but Maier’s use of such strategies surely predates any exposure she could have had to his work. In another picture, Self-Portrait, Chicago, July 1978, her shadow falls on a train-station poster for the movie Heaven Can Wait, displacing its angelically posed image of Warren Beatty. Wittily, the poster is echoed by a similarly composed neighboring ad for Jaws, in which a female water-skier is about to be devoured by that shark. Again, the photograph recalls others – I think particularly of Walker Evan’s Houses and Billboards in Atlanta, 1936 – but although Colin Westerbeck, the essayist in the exhibition’s book, names a couple of photo shows Maier is known to have seen, the predecessors she most admired must remain guesswork. In any case, she makes this subject her own. 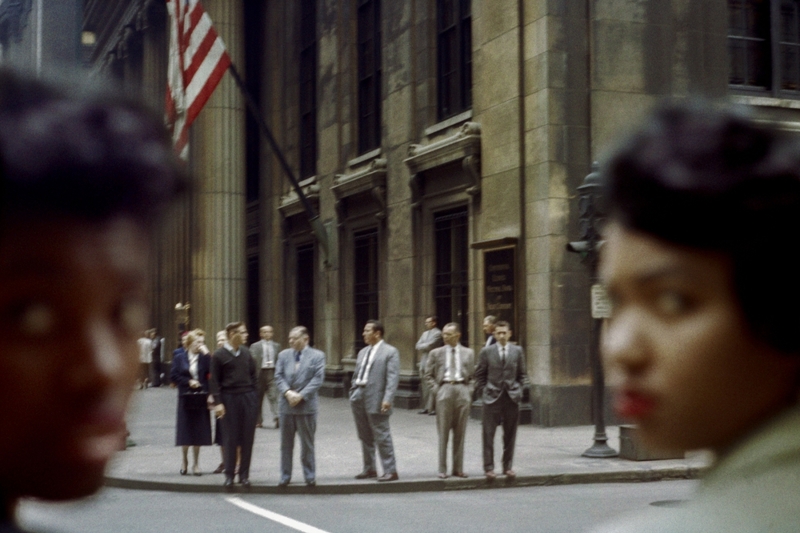 For me, the most powerful image here was Chicago, 1959, a work that addresses color not only photographically but as a social agent. A row of white men in suits stands across the street from Maier, waiting to cross. Nearer the camera, so close that their faces are out of focus, two black women turn to look at the photographer. They are posed at each side of the picture, so that our view of the street runs between them – so that they frame and condition the way we see the men opposite. There is a complicity between Maier and these women; all stand on the same side of the street, facing the power on the other side. But they seem to look at her with a certain suspicion, and she for her part neither sees nor places them clearly. Made sixty years ago, the photo has lost none of its relevance.